This desk and chair are almost identical repeats of pieces which I produced in 1992-3 as speculative exhibition pieces. The originals were in ripple sycamore (Acer pseudoplatanus); the sequels in wych elm (Ulmas glabra). The design came about after much sketching and doodling, in an attempt to create pieces that were both practical and attractive. I am an admirer of Art Deco furniture and architecture but, temperamentally, I feel most at home with the restrained wholesomeness of Arts and Crafts work. These influences, coupled with the known rigid properties inherent in corrugated structures, put me on the road. Essentially, any writing surface which quivers or vibrates in use, no matter how beautiful, is a failure as a design - although, if that turned out to be the case, you could always re-launch it as a hall table and side-step the problem! What finally clinched the design was the acquisition of some spectacular solid ripple sycamore which somehow had slipped through the net and escaped being sliced into veneers. I hoped that the ripple of the grain, at right angles to the shaping of the desk sides, would look good. The second desk and chair were commissioned by a client who already had a small table of mine in wych elm, and wanted the new pieces to match. Other designer craftsmen have said that they don't like repeating a design because subsequent versions lack the creative excitement of the first - repeats becoming lifeless copies of the original. There is much truth in this. You can become totally wrapped up in a new piece, and get a real buzz if it all comes off - whereas a repeated design can sometimes feel a bit of an anti-climax. On the other hand, from a practical standpoint, repeats offer the near certainty, although you can never be entirely sure with wood, that all the constructional headaches have been sorted out, and, vital for the professional maker, the job will be profitable. After a good period of secondary seasoning all the components for the desk are machined to size, allowing for a final hand-planing. The ends are made first, using a tilt arbor table saw to form the angled joints, followed by assembly of the top. Ply tongues are inserted between the edges to add strength, and help line everything up. Regular readers will know that I prefer loose tongues to biscuits, but now that at least one firm makes beech ply biscuits, I have overcome my prejudice and will be getting a biscuit jointer myself before long! Once they had been cleaned up, the ends and top are marked out for the front and back drawer rail mortices, the four sets of double tenons, and the housings in the apexes of the inner faces which accommodate the drawer runners. The rails are similarly marked out. All this is done with a sharp marking knife and gauges for accuracy. 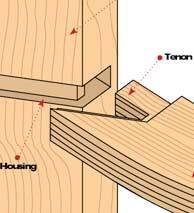 The parallelogram-shaped mortice and tenons are a variation of a classic Arts and Crafts jointing method. I wouldn't have the temerity to claim that I'm the first to have done them like this, but I've never seen any made quite in this way. They are a little more difficult to cut than the usual through tenon and require some patient work with razor sharp chisels to make a neat job. Once this stage is reached the top is offered up to the ends, and the chevron-shaped housings marked directly from one to the other. These are then routed out and cleaned up with a chisel. The drawer rails, runners, and dust panels are straightforward, with due allowance made for movement across the grain. 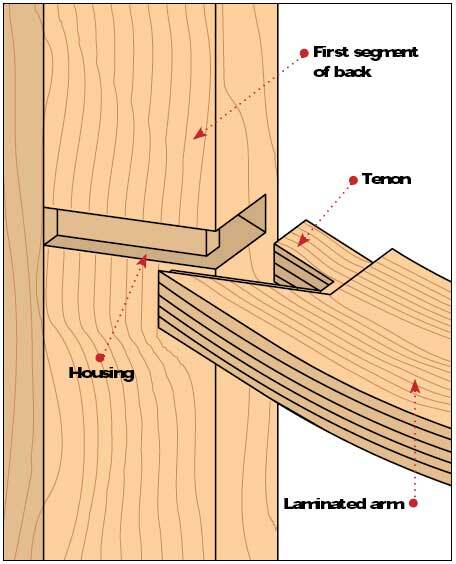 I am always banging on about this, but it is surprising how even professional makers sometimes fail to take this into account when designing in solid timber. 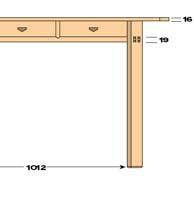 The drawer divisions are stub tenoned into the rails and top. I felt that taking them through would be overdoing it, and might detract from the overall appearance of the desk. The whole drawer runner and rail assembly and ends are glued-up with the aid of softwood blocks temporarily glued on, and left to set after numerous checks to ensure all is square and true. Next, the three back panels are made, and all internal surfaces which can't be reached once the top is in place are waxed and buffed up. The top is glued on and the black walnut wedges driven home - but not before you've made sure that the back panels are in their grooves. Having once glued-up a carcass and forgotten to insert the panels I always do a double check! Many makers glue-up at the end of the working day so that the glue can cure overnight and the piece be ready to work on in the morning; but there is a lot to be said for carrying out this rather vital operation earlier in the day when you are more fresh and alert! 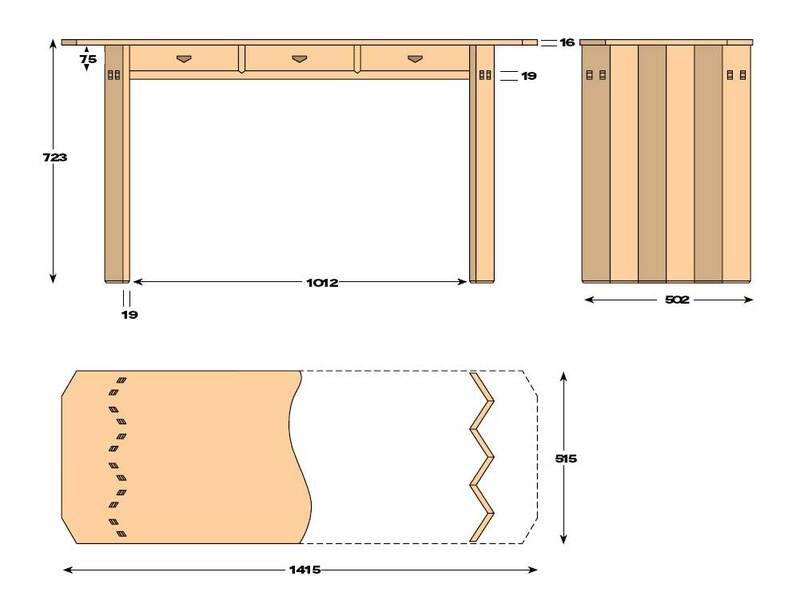 The drawers are made in the conventional way, dovetailed back and front, with oak (Quercus spp) sides and backs, and cedar of Lebanon (Cedrus libani) bottoms. Shaped pulls of walnut (Juglans regia) are fixed to the drawer fronts with stub mortice and tenons. The design of the accompanying chair obviously had to match that of the desk, or at least be stylistically similar. I aimed to do this by giving the chair back the same chevron shaping as the desk ends. The inner face of the back gently curves to provide a comfortable support for the occupant's spine. As a contrast to the crisp angles of the desk, the arms are shaped to spring from the back to the front legs in sweeping arcs. Each arm is built up from 2.5mm (3/32in) thick laminates, cut on the bandsaw, assembled in a jig consisting of male and female formers with cut-outs to accept G clamps. Made of MDF, the jig was devised with the help of Mark Applegate who was sharing my workshop at the time, and drew on the expertise he had gained during his course at Hooke Park. Partly to reduce the stress on the glue lines, but as much as anything to ease assembly, the laminates are pre-steam bent to roughly the final curvature. We considered the resulting arms to be highly successful and immensely strong. When I started out, I took on repair work as well as making new, out of economic necessity and a naive belief that the people whose old furniture I patched up would also commission me to make new pieces, which rarely happened. I didn't enjoy this work since I had neither been trained in restoration techniques nor have the temperament for it, but at least I learned first hand how and why old furniture fails, and try to minimise future problems in my own work. 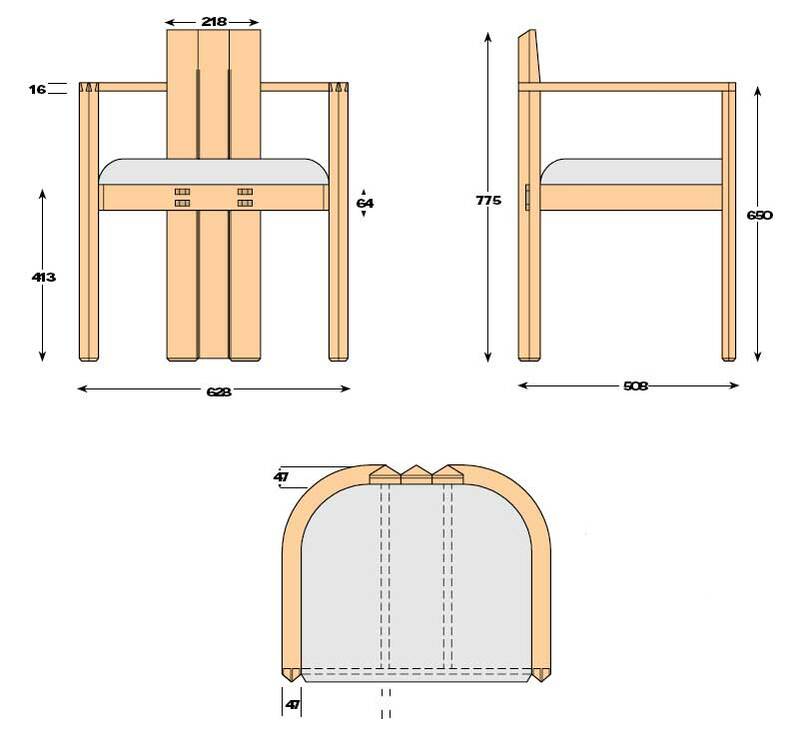 Thus the arms of these two desk chairs are joined to their backs with a substantial tenon and housed in at the same time, see photographs, with the aim that any outward pressure from the sitter's arms actually tightens the joint rather than forcing it apart, in a similar way to opening a drawer which, in theory at least, tightens the dovetails. Continuing the theme of sound construction, the front legs are dovetailed to the arms, orientated so that they won't pull apart with repeated lifting of the chair by its arms. The front seat rail is single tenoned to the legs. In turn, two rails which support the seat are doubled tenoned and wedged into it - these are then through tenoned into the back. The seat itself is simply a shaped ply base, beautifully upholstered by Michael Davies of my nearby Derbyshire village of Foolow. The original ripple sycamore desk and chair were sanded down to 400 grit and sprayed with pre-catalysed lacquer, which is my preferred finish on most light coloured woods which don't have to work hard for a living. If hard wear is likely then an acid catalyst lacquer would be used. The almost unreal figure of the timber, combined with the finish, led several people to remark that it was hard to believe it was actually wood - I'm not sure if that is a compliment or not! Such a finish is in my view not appropriate to an open grained timber like elm, so the sequels are sanded to 280 grit and given several coats of Danish oil, carefully steel wooled and cleaned off between coats, then buffed up with a soft cloth. Having recently seen the sycamore pieces again - the couple who bought them have gone on to commission several more items - I'm still not sure whether I prefer the design in one timber or the other, but it reminded me what an amazingly versatile material we have available to us, as woodworkers. The timber for these pieces came from a huge tree which I bought as a freshly felled log in the mid-80s - a victim of Dutch elm disease - and had sawn into various thicknesses at a local mill. It has been in stick since then, out in the open air covered with old sheets of corrugated iron to keep the rain and sun off. Never put iron or steel sheets over oak, by the way, or the timber may end up stained blue-black, as when an old nail is embedded in it. After all this time the elm is as well air dried as it ever will be. The main drawback to seasoning and storing timber in this way is that it is prone to infestation by the furniture beetle. This generally seems to attack only the sapwood of elm, or boards which are a bit dodgy, that I would avoid using anyway. Suspect planks must be carefully checked and, if they have to go, can at least be cut up into firewood. The various parts of the chair and desk were roughed out and stacked in the warmest part of the workshop, allowing air to circulate freely, and left for a couple of months until the moisture content had fallen to 10 or 11%. 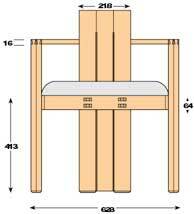 The success of a piece of furniture relies heavily on careful timber selection. For example, make sure that a row of drawer fronts are all cut from the same board. If it is not possible to get a good grain match between adjacent boards, then adapt the design to make a deliberate feature of this.